When I moved to Brooklyn and starting working in publishing, everyone warned me that adopting a cat was inevitable, but I shrugged them off (didn’t they know I was a dog person?). But the truth was, my salary could barely sustain me and my book-buying habits, much less another living being, cat or dog. Then I discovered the ASPCA’s foster pet program, which seemed too good to be true. After a two-hour volunteer training seminar, I could be added to a listserv that advertised the animals available each week, along with the promise to send them home with all the supplies and food they needed, free of charge. After deep soul-searching and my roommate’s (wise) insistence that I would never give up happy hours to walk a dog, I signed us up for kittens. 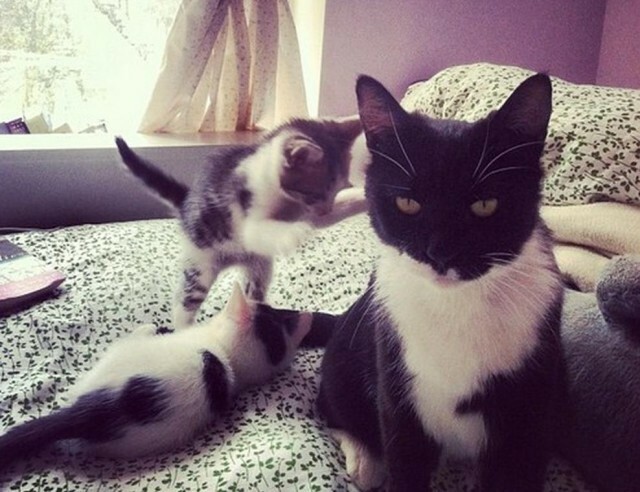 One year later, I’ve fostered fifteen kittens and two mother cats. I’ve discovered every kitten hiding spot in my apartment and spent too many hours posting photos of them in seasonal outfits to my tumblr. I’ve also cried on every park bench within a six-block radius of 92nd Street and 1st Avenue after returning them to the ASPCA. But the tearful goodbyes are always worth it, because I know that the animals will get adopted by a family that can take care of them forever. Are you wondering if fostering kittens could be right for you? Below are all the foster kitten related expenses that I’ve accumulated over the past year. • $7.99 — two ceramic food and water bowls: Did you know that Martha Stewart has a line of pet products at Pets Smart, including a fashion collection for dogs? I decided that my foster kittens could eat out of generic bowls because my tableware comes from the Salvation Army. • $3.49 — Cat brush: I once fostered a momma cat that had a tiny mat of hair on her back that stuck up like a shark fin. I thought it was cool, but my roommate made me brush it out. • $6.99 — Litter scoop + litter box: While I still land firmly on dogs > cats, there is no denying that kittens are tiny geniuses — they are litter box trained by the time they are 2–3 weeks old. • $79 — Macbook Air charger: Kittens love to keep you company next to your computer, but it turns out their teeth are sharp. • $3.49 — hypoallergenic natural cat wipes: Sometimes when kittens are rescued from hoarding situations, their digestive systems are overwhelmed with bacteria, which means a lot of poop. • $6.95 — disinfectant wipes: Did I mention kitten poop? • $4.99 — cat litter deodorizer: Yep. Another poop related expense. • Alcohol (~$30 per set): When they are staying with me, my foster kittens maintain a more active social life than I do. Like Baby Jesus, people will bring over beer and/or wine for an excuse to visit them. • Therapy (priceless): Every morning, I open my bedroom door to find two to three tiny furry faces waiting for me to feed and play with them. They don’t care how grumpy I am, or if I listen to Taylor Swift’s album on repeat, as long as I can offer them a lap to sleep on. Also, aside from a grilled cheese sandwich, there is no better hangover cure than a catnap (see what I did there!) on the couch, with two or three kittens in your lap. In short, everyone should foster animals (but please make sure to leave some kittens for me!). Angela Velez edits young adult fiction and occasionally blogs about foster kittens, piñatas, and nail art. You can find her on twitter at @frozenfresa.